Chose one sheet of origami paper together with the 3 A4 sheets of printing paper. Folding instructions: Fold two opposite sides on your origami sheet. Folding instructions:Fold the longer sides of your rectangle onto each other in order to obtain the measuring tool. 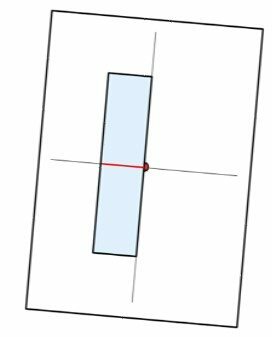 The measuring tool: The tool is used for measuring right angles and side lengths.In this lesson it will be used to make the circle. Folding instructions: Fold parallel shorter sides and open the fold. Color the folded line with a marker. Folding instructions: Using a A4 sheet fold opposite sides onto each other and open the folds. Instructions: Mark the intersection point of the folds and place your measuring tool in the place shown. Instructions: Place the measuring tool exactly at the position point as shown. Check that this is done exactly as required. Instructions: After placing the tool in the correct place turn it in one direction and at each turn mark 2 dots. יש לשים לב שהנקודות המסומנות הן דרך אותה הצלע של המודד. A discussion question: After repeating the instruction what shape has been obtained? Explain. 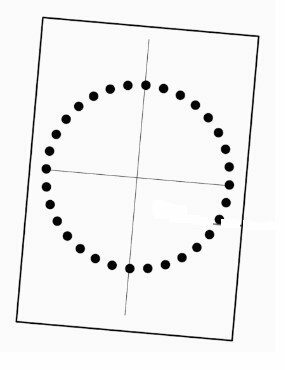 Answer: If the dots are joined the shape is a circle. A discussion question: Have you formed a circle? Some pupils may not have done this exactly so another attempt should be made on an other sheet given guidance. Folding instructions: Turn over the sheet. The sheet is turned over to the side without points. Folding instructions: Fold the two shorter sides onto each other. Folding instructions: Cut along the line of dots. Folding instructions: Fold the circle as shown. Folding instructions: Once again fold the circle as shown. Folding instructions: Open the last fold to obtain a quarter shape of the circle. Folding instructions: Open the quarter shape to obtain the shape of half a circle. Folding instructions: Open the half circle to obtain a complete circle. Next activity: Representing the concept of angle as a measure of rotation. Scissors, origami paper and A4 sheets.